This aerial photo shows the campus of Amazon headquarters in Seattle. The online retailing giant is looking for a place to building its second headquarters, and Philadelphia hopes to get prime consideration. Mayor Jim Kenney wasn't able to hide his optimism Thursday morning after Philadelphia formally submitted its proposal to land Amazon's second headquarters – a prize that includes 50,000 jobs. Kenney heralded Philly as being in a "Goldilocks zone" for Amazon, pointing to the city's talent pool, affordability and strategic location along the Northeast corridor. "I just want to say that we're going to win," Kenney proclaimed, sparking a round of cheers from supporters who gathered at the Barnes Foundation. "But regardless, I have never been more proud of our city and our region. Everything we've done has really stepped up to the plate." Cities vying to land Amazon's second headquarters, dubbed "HQ2," had until Thursday to submit a formal proposal to the online retailer. As part of their proposal, Philly officials revealed a website – public.philadelphiadelivers.com – detailing three potential sites for Amazon's headquarters. Using an array of videos and interactive maps, the website also touted the city's talent, logistics and liveability. But it made no mention regarding the extent of Philly's tax incentive package, likely a key factor in luring Amazon to any city. Kenney declined to discuss economic incentives when speaking to reporters on Thursday. "We're not going to talk about any incentives," he said. "We're not going to talk about any dollars or numbers. We still have to have a conversation with the Commonwealth about what their numbers are and what we can provide." Pennsylvania plans to offer Amazon more than $1 billion in tax incentives, Philly.com reported on Wednesday. Any company, including Amazon, is eligible to receive benefits that come from real estate tax abatements and Keystone Opportunity Zones. But Kenney said any additional incentives must still be determined. Philly's proposal offers three possible host sites: Schuylkill Yards and uCity Square in University City and the Navy Yard in South Philadelphia. "We have space to do this," Kenney said. "I think we're positioned to make the short list and win this." All three urban sites are ready to accommodate Amazon’s full development immediately, but Kenney said the city would work with Amazon if it preferred another location in the city. "I think the Navy Yard is an obvious one, because of the financial districts that are there, its proximity to the airport and to our highways," Kenney said. "And, just the cool vibe that's down there with Urban Outfitters and all the other companies that are there." 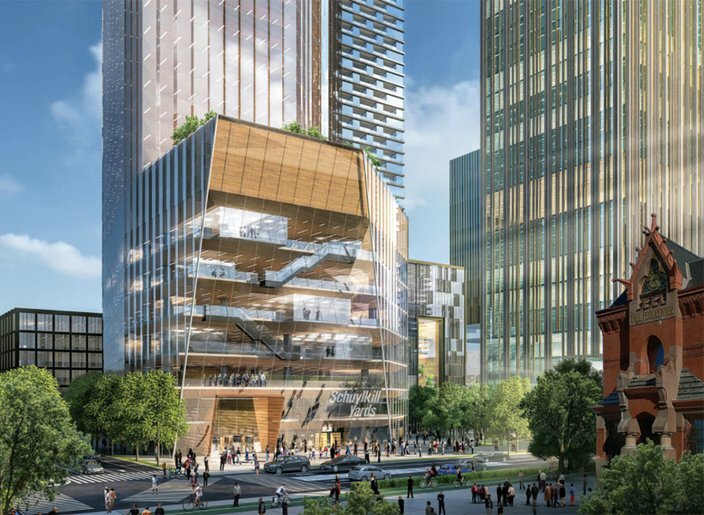 Schuylkill Yards and uCity Square would place Amazon within walking distance of Drexel University and the University of Pennsylvania, two of the region's top educational institutions. Moreover, the city says it offers a deep talent pool. "With a dynamic technology sector, access to technical talent, and a fast increasing millennial population, Philadelphia has serious growth potential," the web site said. Both Philadelphia and its cross-state rival Pittsburgh could be contenders for Amazon's second headquarters, according to a Moody's Analytics report released last week. Amazon is looking to construct another headquarters somewhere in North America. The Seattle-based company has pledged to spend more than $5 billion to do so, saying the new space will bring as many as 50,000 new, full-time jobs over the next 15 years. The company has said the average salary of those jobs will top $100,000. 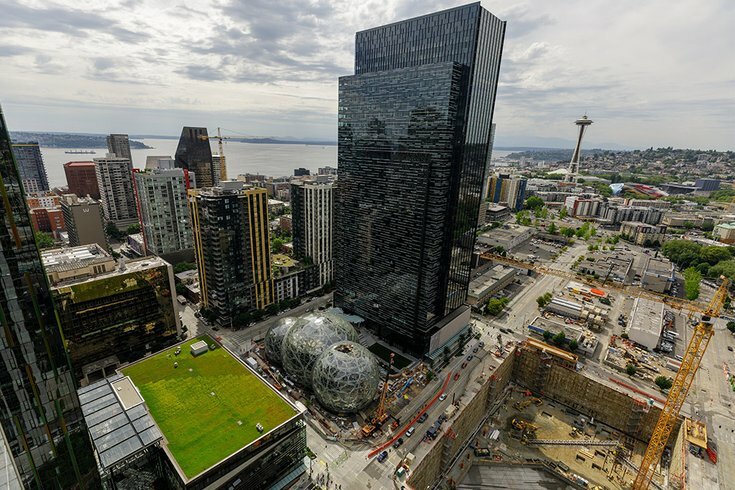 HQ2 is expected to rival the company's Seattle campus, which takes up 8.1 million square feet, has 33 buildings and 24 restaurants and is home to more than 40,000 employees. Amazon is seeking a spacious, new location in a metropolitan area with at least 1 million people. The location must have mass transit, proximity to an international airport and the capability to attract top technical talent. The company is expected to announce its selection sometime in 2018. "I'd be really disappointed if we didn't make the short list," Kenney said. Philadelphia Mayor Jim Kenney unveils details of the city's application to Amazon, which is searching for a U.S. city to build a second corporate headquarters. “I just want to say that we're going to win,” Kenney told a crowd of supporters Thursday morning at the Barnes Foundation museum. Moody's Analytics, based in West Chester, listed Philadelphia as the third-best option for Amazon's headquarters in an analysis based on Amazon's stated preferences and economic factors. Austin, Texas and Atlanta finished ahead of Philly. But when Moody's added geography as a factor, Philly vaulted into the top spot, with Pittsburgh moving into second place. Municipalities across the country have jumped at the chance to bring Amazon into its city. It is expected that the winning city will provide the online retailer with a slew of tax incentives. Though Kenney declined to discuss any specific tax incentives, City Council has taken action potentially aimed at enticing Amazon. One of the proposed sites for Amazon's HQ2 is at the 14-acre Schuylkill Yards development in University City. This rendering was provided by the developer, Brandywine Trust. Last week, a City Council committee unanimously approved a bill that would renew 12 Keystone Opportunity Zone designations in University City. Such designations eliminate a litany of state and local taxes for a 10-year period, providing an incentive for development. Councilman David Oh also has introduced legislation that would eliminate the city's business net income tax for 10 years for Amazon. The savings could be as high as $2 billion. The unveiling of Philly's Amazon proposal marked the end of a week-long, social media campaign designed to highlight Philadelphia's strengths, including its educational institutions, diverse workforce, affordability and strategic location. 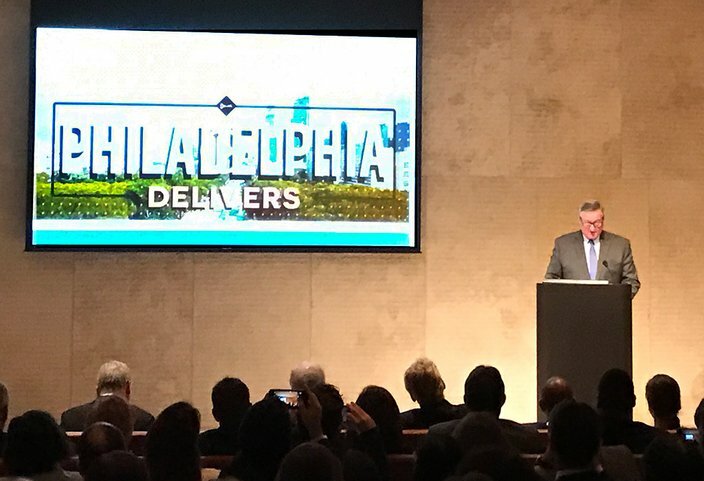 Dubbed "#PhillyDelivers," the campaign featured videos of educational and business leaders touting the city. Additionally, more than 150 business leaders and 65 college and university presidents signed letters of support. Another 90 entrepreneurs and tech start-ups also provided testimonials. "We are a diverse city," Kenney said. "Our diversity is what makes us strong and gives us our identity. We should celebrate that." The proposal process brought together Philadelphia's business community in a way that has not happened in some time, Kenney said. The process made them realize how "incredibly lucky" they are to be situated along the Northeast corridor. "Philadelphia has always been the city of the big shrug," Kenney said. "We're in the shadow of New York and Washington – but we're not. We have our own brand. We have our own identity. We have the ability to put our face out there and to win." Elsewhere in the region, Bensalem, Bucks County; Chester, Delaware County and Camden County, New Jersey also were expected to submit proposals to Amazon.